The fourth and penultimate alliance of the 2018/19 season took place at Whitefields Golf Club on Monday 4th February. There were some fears of cancellation as happened here last season, however the forecast promised that it would be warmer than of late and the overnight rain would have passed. The early ladies did have to contend with a damp start with mizzly rain but it cleared and everyone enjoyed their day, with good company and some very reasonable golf. There were a few damp patches on the course & there was little run on the ball, but the ladies simply got on with these conditions, played the course as they found it and those who had brought sunglasses were happy they had done so when the sun came out! It certainly shone on the pair from Forest of Arden Golf Club, who romped home with 34 points. Amanda BROOME and Margaret MANDER were clearly delighted. 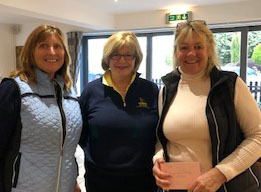 In second place were the Copt Heath pairing of Gillian HAYWARD and Lynda WEBB with 32 points. A special thanks to the two gentlemen who marked for the first pair out and to the lady captain, Jackie EDWARDS, and Carole DOWSE for looking after us so well. County President, Anne PARRY thanked Whitefields for hosting the event and presented the winners with their prize. The final Alliance takes place on Monday March 4th at Moor Hall Golf Club.